An alto saxist, playing Ewan McColl’s The First Time Ever I Saw Your Face, with every phrase so extended it took the entire length of the subway corridor for the tune to fall into place, which it did, rather beautifully. And at 30p, cheaper than an iTunes download. Found in a folder of old things: this returned envelope from a simpler, less efficient time. 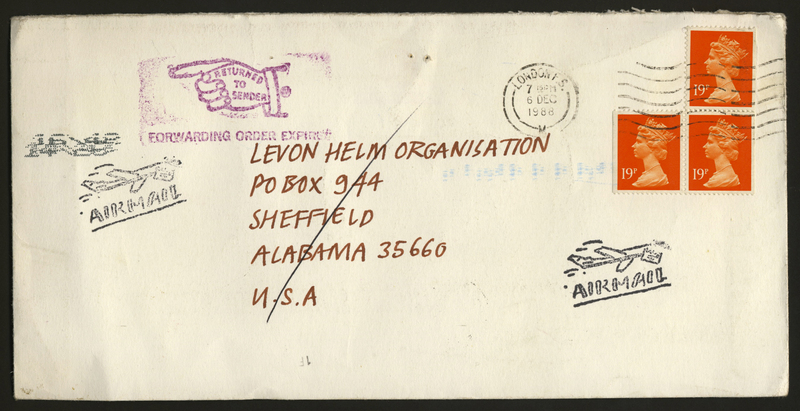 Attempting to join the Levon Helm Organisation, which would have given me an 8″x10″ glossy and a quarterly newsletter. For $6. MySpace, Facebook, Twitter? What? Who needs ’em? For illustration fans: The early Isabelle Dervaux rubber airmail stamps are trumped by the United States Post Office Returned To Sender. I’m working on a book with a great musician, Sammy Rimington. Sammy’s played clarinet over the years with some of the greats of the Jazz world, as well as with the likes of Muddy Waters and Ry Cooder, and I asked if he’d bring his clarinet the next time we met to work on the book, a scrapbook of his life. He obliged and, sitting two feet away from him as I pushed the record button, was struck by how great it was to be in such proximity to a) a great musician, and b) that most gorgeously fluid and smoky-sounding instrument. Talking with my friend Steve Way about the Gerry Rafferty doc, he proposed that future music documentaries should be made in appropriate formats. eg: Punk Rock documentaries should be very short, preferably under three minutes; Prog Rock documentaries should be be extremely long and in multiple parts (the “Gatefold” approach). The Graham Norton Show, BBC1. Kasabian are so bad, so indie dishwater bland, they make me want to crawl into a hole and die. All the moves, all the thin jeans and pointy shoes and shades in the world couldn’t rescue the flaccid strumming and the la la la’s. Goldie Hawn attempted to describe this sorry mess, causing the singer (looking for all the world like someone’s dodgy bearded uncle) to reference Be My Baby and Roy Orbison. Over on BBC2 a few minutes later, a discussion about Lou Reed reaching seventy. After a clip from Later, of Lou with Metallica, writer Christina Patterson made this observation: “I kind of think—why should he carry on doing the same stuff? He did some stuff absolutely brilliantly, that’s more than most of us do in a lifetime and I think it’s a great temptation for artists to do the same thing again and again… And I think good on him… to try and do something fresh. Personally I think it’s disastrous, but I don’t see there’s anything wrong in the quest…” Absolutely spot on. But then Lou’s done something great in the first place, unlike Kasabian. Result? Victory for Lou!